It used to be that multiple generations lived under one roof, but now most families have their own home. One family in South Surrey, British Columbia is going back to that traditional familial setup with three generations in one house. Designed by Marken Design + Consulting, the highly efficient Passive House features solar hot water heating, sustainable and locally-sourced materials, and rainwater collection - and all of its residents benefit from having close family connections. Work began on the South Surrey Passive House designed by Vancouver-based Marken Design + Consulting in 2012 and it was completed in 2013 with three generations of a family living in it – grandparents, their daughter and her children. Living in this configuration isn’t typical in the West anymore, but it has a lot of benefits. The house is in constant use, the grandparents can help with raising the children, they work together on meals and projects and they are more efficient with energy and water use all together than in separate homes. Thus the family has greatly reduced their environmental impact by living together. On top of that, the home is the first Passive House in the lower mainland of British Columbia. Inside you’ll find low flow fixtures, flooring and finishes from sustainable sources, local and recycled materials and no VOCs at all. Outside, the roof collects rainwater to flush the toilets, native landscaping, permeable paving, and a solar hot water heater that works in conjunction with drain water heat recovery to reduce energy use. The home was nominated for Surrey’s Clean Energy Award 2014. Work began on the South Surrey Passive House designed by Vancouver-based Marken Design + Consulting in 2012 and it was completed in 2013 with three generations of a family living in it - grandparents, their daughter and her children. Living in this configuration isn't typical in the West anymore, but it has a lot of benefits. The house is in constant use, the grandparents can help with raising the children, they work together on meals and projects and they are more efficient with energy and water use all together than in separate homes. Thus the family has greatly reduced their environmental impact by living together. On top of that, the home is the 1st Passive House in the lower mainland of British Columbia. Inside you'll find Low flow fixtures, flooring and finishes from sustainable sources, local and recycled materials and no VOCs at all. 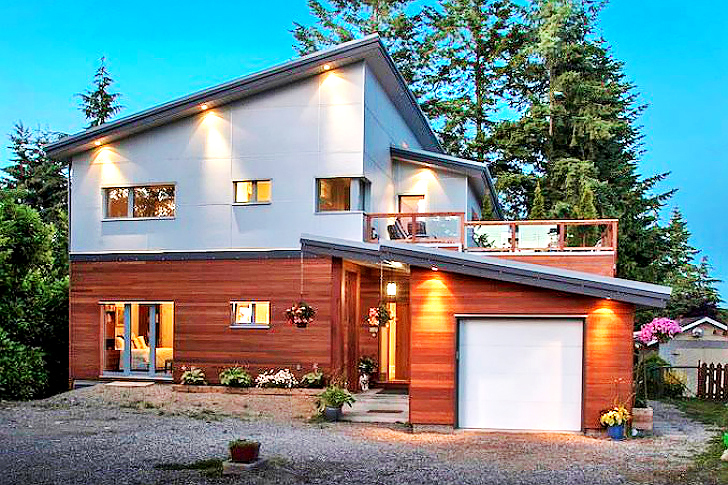 The home was nominated for Surrey's Clean Energy Award 2014. 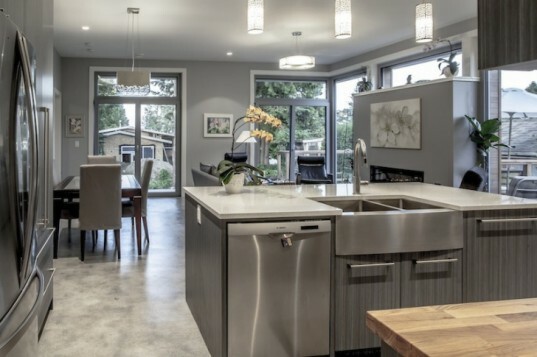 An inside look at all the technology and mechanics that make a passive house possible. Outside, the roof collects rainwater to flush the toilets, irrigate native landscaping, permeable paving, and a solar hot water heater that works in conjunction with drain water heat recovery to reduce energy use.